A Whale of a Summer Tale to Tell! 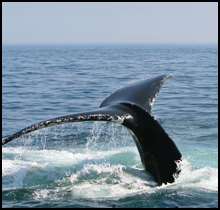 It's been a WHALE of a summer so far.....incredible weather, fun-filled events and activities galore. As we approach the end of the season, we want to be sure you have a great whale of a tale to share about your summer! There's still time to make memories to treasure forever. Check out our end of the summer deals or reserve one of our money-saving PACKAGES to end your summer with a splash!